How Sad is that Doggie in the Window? Pets are property, and while we debate the moral underpinnings of that distinction, they are regulated by commercial laws. It’s a tricky business treating living creatures as commercial goods; while many laws and regulations on commerce seek to protect vulnerable consumers, when the goods are pets we must talk about the welfare of the good itself, and not just in terms of resale value to buyer and seller. Actually, it’s still all about value, or rather the bottom line. Supply and demand still reigns supreme, and when supply is up, cost comes down, even with steady demand. My apologies to any economists reading this for my over-simplification, but this is a trend quite prevalent in our country’s pet stores. Pet stores, the kind you see in malls across America, are fed by commercial breeding facilities, aka “puppy mills.” By holding their breeding standards to the same candle that lights the inside of the CAFO industry, puppy mills are able to mass produce animals for mass consumption. 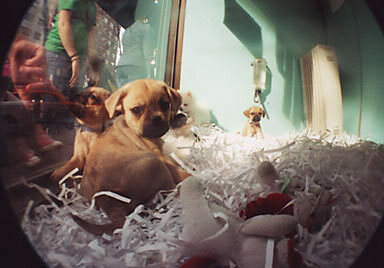 The retail outlets who sell these animals cater to a market that has regretfully poor knowledge of the conditions of these facilities, filled with people who see only the fuzzy puppies rolling in paper shavings in the window with a reduced price tag. The desire to save money when shopping isn’t in itself despicable, but your pocket’s savings on a good deal have to be realized elsewhere, whether in the indentured servitude of overseas workers or the liquidation of a local business. With pet stores, it is the animals who eat the cost with their quality of life and health. Certainly not all animal breeders fall into this category, but how is the average person looking to add a companion to the family to know who is buying from healthy breeders? Enter Jon Cooper of Suffolk County, NY. Mr. Cooper previously helped orchestrate the country’s first animal law abuser registry. His most recent effort is to introduce a bill to create the country’s first rating system for pet stores that sell puppies, modeled after the rating system in place for restaurants. The bill also calls for an incentive program to encourage stores to buy from breeders who exercise humane care for their animals. the living conditions of puppies and dogs at the store and at the sourcing breeder; the veterinary care provided at the store and at the sourcing breeder; the nature and type of kennels and cages and any materials provided therein at the store and at the sourcing breeder; the animals’ access to food and water at the store and at the sourcing breeder; the socialization and exercise of puppies and dogs at the store and at the sourcing breeder; the location of puppies and dogs in the store; the availability of educational information on companion animals, including breed specific information, for consumers; the inspection policy of sourcing breeders used by a store; and the breeder’s license status with the USDA, including any violations upon inspection. The committee will be composed of representatives from the Pet Industry Joint Advisory Council, The AKC, the ASPCA, a Long Island-based animal welfare organization, and the Commissioner of the Department of Consumer Affairs. A separate four member board, consisting of the Commissioner, the Suffolk Count SPCA, a Long Island-based animal welfare organization, and a retired veterinarian, will rate the stores based on the established criteria. The bill is far from perfect, and certainly has its opponents. The program is not mandatory, with store owners choosing to participate and willfully submitting their information. While those that participate will display their ratings in a window near the entrance to the store (rated on a scale from 1-5 ‘paws’), it is hard to imagine any store that would risk being rated less than four or five ‘paws’ participating. Thus there is the potential that the average person will not be aware of the rating system. But while the bill may lack teeth, it does have brains and heart. The intent behind this bill is well-based. It attempts to address an established and insidious problem facing animals, and while it only contemplates puppies, the intent is to help animals as a whole; one can imagine the potential pitfalls of trying to regulate all pets, or even all mammals under the same breeding criteria. It will probably be some time until pet stores can be adequately regulated under the law for animal abuses, as commerce laws in many states protect the right to sell this “property.” Bills like this one from Suffolk, however, are a progressive step towards that goal, and unlike recent New Jersey law, this rating system is an example of considerate legislation for the advancement of animal welfare. shelter and adopt a puppy/kitten and save them from euthanasia. couldn’t help but wonder, what would happen if this had happened after the mall closed and the store was closed for the day. I have never purchased a puppy from a pet shop. Animal shelters have plenty of dogs needing homes. I’ve also found and taken in strays. Somebody almost always has puppies to give away. Check your local classified ads. If you are looking for a purebred, you should be able to find those locally from a private source as well. Please remember, spay and neuter your pets.